Sewn tapestry fabric covered with leatherette trim. Clear 2-up plastic pockets with white mesh background. Holds two 4x6 per page. Capacity: 208 photos. Note: Image shown may not reflect actual style. 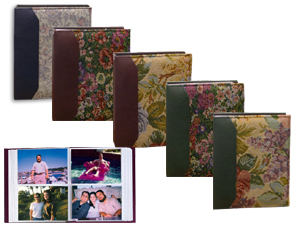 This album ships in multiple fabric designs and comes with either a burgundy, dark green or blue spine. All fabric designs are similar, but we do not offer a choice at this time.